I have said this before, but growing up with a German mother meant we ate a lot of Nutella. I loved it as a child. Now I know that store bought Nutella is very unhealthy. So I have created my own Healthy Homemade Nutella. I have used it in many dishes on this blog. Now it is time for a Raspberry Nutella Tart. We all need to enjoy a tart every once and a while. I love them and they are perfect for summer. There is no cooking involved! These are completely raw. They are also vegan, grain free and gluten free! If you feel compelled to cook the crust, you can. You just don’t need to. These are very easy to make even though they look kind of fancy. In a food processor , grind up the almonds until they are a course consistency. Once they are ground, add in the dates and water until the dough comes together. If you are not using a high powered food processor , you might want to soak the dates for 5 minutes in water to soften them. 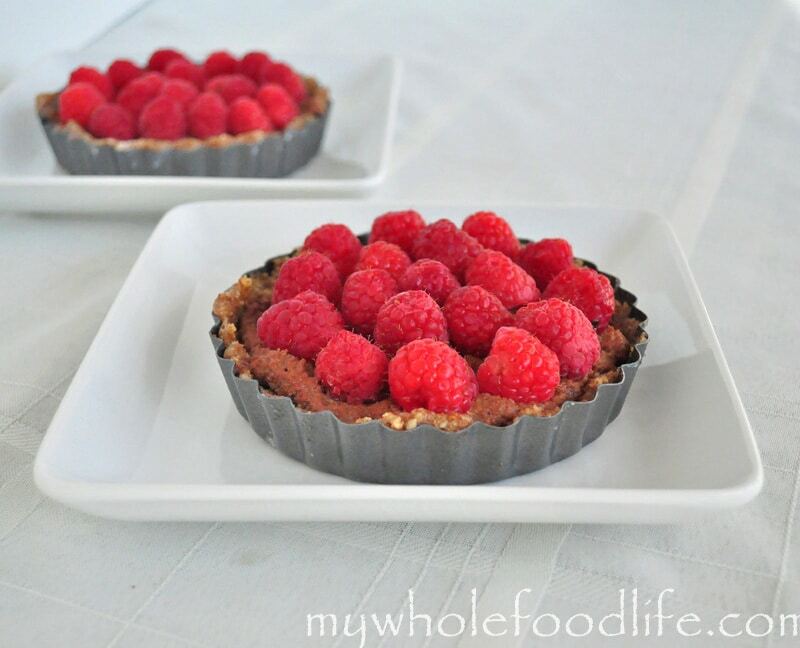 Grease your tart pan or mini tart pan s and then press the dough into the pan and up the sides. The dough will be sticky and I find that working with wet hands helps. Once the dough is set into all the tarts, place them in the fridge to firm up. About 30 minutes. While the tarts are setting up, you can make the filling. In the food processor , grind up the hazelnuts into as fine of a powder you can get them. Once they are ground, add in the remaining ingredients. If the mixture seems too thick, you can always add a bit more milk. Once the crusts are set, spoon the filling into each one and top with the fruit. Thanks for the wonderful recipe! I am on the search for a canned coconut milk product that comes in a BPA free container. The product you linked to on Amazon does not say whether it is BPA free. Do you know if it is? Do you think it matters for coconut milk? Thank you! Gorgeous! I am definitely pinning to my paleo board, this will be a hit! Hi Melissa! Happy New Year! I was hoping to make your Healthy Nutella Recipe but it says the page can no longer be found? Not sure if it got missed if you were working on your site. Hope to see it soon! Thanks for the great work! Ok! I will definitely be buying your cookbook! Looking forward to it!